Retail design is heading in an interesting direction, inspired by the new brand of consumer austerity, as Eryn Behan from Mudpie reports, ahead of her forthcoming presentation at Fashion Exposed. Like architecture, the interior design sector has had a major shakeup, laying the grounds for a fertile new landscape of innovation and creativity. In retail especially, brands have had to go that much further to appeal to the uninterested and now more austere consumer. From derelict warehouse spaces to temporary pop-up stores, interior design has been used as a way of engaging consumers and offering them unique retail experience. 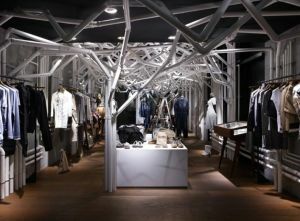 The use of contours and layering using materials such as plywood and cardboard is a clear trend in the retail sector. Textural archways create an artificial yet organic environment, heightening customers’ perception of both space and product. This is a cost-effective method of temporarily changing the identity of a space to capture the imagination of consumers and offer them a new retail experience. Japanese architects Suppose Design Office, have completed a boutique made of cardboard tubes in a Hiroshima shopping centre. ‘Karis’ features tubes of different lengths suspended in clusters to create ‘caves’ within the space, similar to the concept of the labyrinth woods by Ben Naqoka. ‘Nature Factory’ by Makato Tanijiri of Suppose Design Office, features plumbing arranged to look like an arbour of trees. The purpose behind this design is to offer a new shopping experience that people can interact with products whilst strolling in mysterious natural surroundings. Boutique Runway by Italian design studio CLS Architetti is made up of wavy profiles that cover the walls and ceiling to resemble an ice cove. The interior space was built through the construction of a three-dimensional model and each lamella is hand crafted. Belgian artist Arne Quinze has created a rough luxe fantasy space for retail store L’eclaireur in Paris. 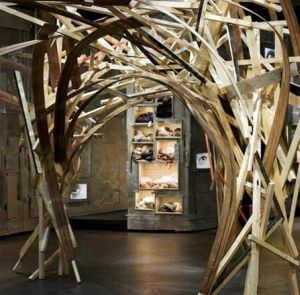 The space uses recycled materials, with a one-off archway made out of entangled wooden planks, as if to emphasize a notion of ordered chaos. The exclusive Australian representative for global trend forecaster Mudpie, Ginger Trend Consulting will present Mudpie’s Autumn/Winter 11/12 trend forecast during Fashion Exposed.